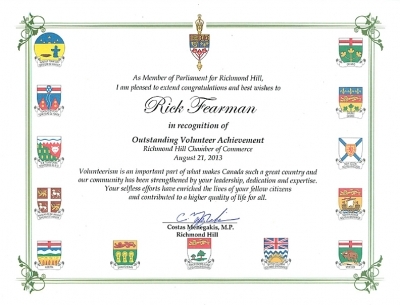 For the second year in a row, Rick Fearman has been recognized for his outstanding contributions to his community. The award for Outstanding Volunteer Achievement was given to Fearman by Richmond Hill MP Costas Menegakis. Schooley Mitchell’s Rick Fearman recently received two awards recognizing his outstanding contributions to his community. The first, the Outstanding Volunteer Achievement Award, was given to Fearman by Richmond Hill MP Costas Menegakis. The second, a certificate of appreciation for his dedicated service to the Richmond Hill Chamber of Commerce, awarded to him by Board Chair Marj Andre and Chamber CEO Leslie Whidden. Schooley Mitchell’s Rick Fearman was on hand for a meeting with Tim Hudak, the leader of the Ontario opposition, at the Richmond Hill Chamber of Commerce. 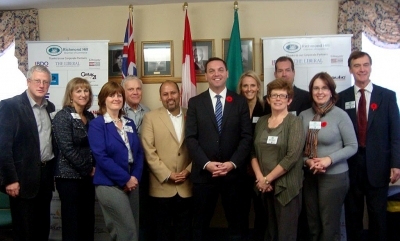 He is pictured above, at far right, with fellow Chamber directors, Hudak and Richmond Hill Progressive Conservative candidate Vic Gupta. The roundtable discussion focused on transportation and the need to ease traffic gridlock, job creation and government tax and spend policies. Fearman was proud to represent the local business community at the event. 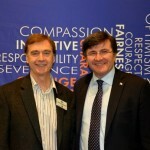 Schooley Mitchell’s Rick Fearman, left, with Richmond Hill MP Costas Menegakis at the annual Mayor’s Character in Business Breakfast. The event, hosted by Mayor Dave Barrow, focused on the integrating the Character Community Initiative in local business, helping companies create an environment that promotes respect, boosts morale, increases loyalty, and recognizes outstanding achievement.